Over the years bet365 have gone one to become one of the largest sports betting brands in the world. With product being distributed in over 200 countries worldwide and millions of customers, it didn’t come as much of a surprise in the industry to hear of them releasing their mobile betting app. Even inits relatively short time within the marketplace the app has seen many changes in terms of both design and functionality. The increased use of mobile technology in betting has caused for a gulf of betting sites to adapt their sites to fit the smaller screen sizes of smartphones and tablets. Bet365 have taken this market very seriously and have provided one of the best apps in the industry. Mobile users can enjoy welcome bonus (18+. Terms and Conditions Apply.) when they register a new account with bet365. You can sign up directly through their betting app, so there is no need to even access a PC or laptop for this. The free bet will work with any smartphone or tablet device with your account becoming active immediately. If you do decide to register via this site with a PC then you can use the same username and password to log into the bet365 app whilst still being able to access your free bet. As you would expect with a company such as bet365, their mobile betting app is available on a host of platforms including Nokia, Blackberry, iPhone, Android and Windows Phone. The app will be identical on each but will adjust to your screen size making it look and function perfectly. 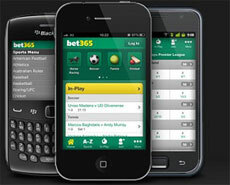 iPhone users can access the bet365 app directly from the App Store, with the same applying to Android users from the Android Store. All other smartphone and tablet users need to do is visit the best365 site from their device and they will automatically be redirected to their mobile betting app. One thing that you will notice straight away with the bet365 app is that is runs super smooth with a 3G connection. Each page takes just seconds to load and you can easily navigate yourself around the betting app with the quick link buttons found at the top of the page. The colours of green, yellow and the grey background work really well and provide a clean, slick betting app. Once into the main sections of the app it’s easy to find what you are looking for in terms of sports or markets. The betting selection process allows you to simply add to bet slip without having to go back and forward if you want to add multiple bets to your betting slip (of which can be found at the top of each page). Bet365 were one of the first advocates of live betting in the industry, and they have continued to provide this service via their mobile betting app. They have created a wealth of live betting opportunities on their app which can be accessed easily and efficiently. Even more important than this is that they automatically refresh so you can be right up to date with all the latest live odds. Their best feature has to be their live streaming channel which can be used on iPhone, iPad and Android devices. Sports include horse racing, soccer, tennis, basketball, snooker, darts and lots more. It’s such an impressive feature to have via a simple betting app that it really sets it apart from the majority of its competitors. Bet365 are a company that has been leading innovation in the betting industry for many years now. Their app epitomises all that’s good with their betting ethos. When you go through all the features and functions that are available it may seem overwhelming, but to use it first-hand everything is so simple. For people that are familiar with bet365 it’s probably of little surprise to hear a raving review about a new product or feature they have released. For those of you that aren’t, then you need this betting app in your betting arsenal!